The producers are organized in cooperative groups.They are fully autonomous in managing group affairs with the assistance of our Education Team as required and follow the cooperative principles. 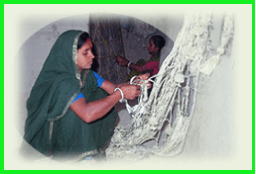 At present, there are 220 co- operative groups with 4856 female and 160 male produc -ers in 16 districts of Bangladesh. In the field,volunteer supervision of production by group leaders and regular followup visit by the Education Department ensure that the women receive a fair distribution of job orders. 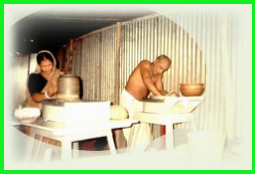 The producers make delivery the products timely and receive fair wage for their work.Problems in production, if any, are sorted out by the groups or reported to CORR-The Jute Works to make up the anticipated shortage from another group.Joborders are given, according to the number of producers in the group and their skill. Producers learn how to save a portion to their earning on a regular basis for future gainful investment. Since the producers are the main concern of CORR-JW, all its efforts and resources are gear to their needs and benefits.